IMGT®, the international ImMunoGeneTics information system®, http://www.imgt.org, created in 1989 by Marie-Paule Lefranc in Montpellier, France (Laboratoire d'ImmunoGénétique Moléculaire (LIGM), University of Montpellier (UM) and French National Center for Scientific Research (CNRS)) has for mission to be the global reference in immunogenetics and immunoinformatics. IMGT® is in charge, since its creation, of the International Union of Immunological Societies (IUIS) Nomenclature SubCommittee, IMGT-NC, for the nomenclature of the genes and alleles of the immunoglobulins (IG) or antibodies and T cell receptors (TR) of all vertebrate species with jaws (gnasthostomata). IMGT® is attached to CNRS, to the University of Montpellier and to the Ministry of Higher Education, Research and Innovation (MESRI). CNRS registered trademark (European Union, Canada, United States). The IMGT Nomenclature Committee (IMGT-NC) is the IUIS Immunoglobulins (IG), T cell Receptors (TR) and Major Histocompatibility (MH) Nomenclature Sub-Committee (IMGT-NC) since 1992. Academic Institutional Member of International Medical Informatics Association (IMIA) since 2006. Partner of the European Life sciences Infrastructure for Biological Information (ELIXIR) IFB French node. Member of the Global Alliance for the Genomics and Health (GA4GH) since 2015. Member of the Institut Français de Bioinformatique (IFB), since its creation in December 2014. Member of GDR CNRS n° 3003 Molecular Bioinformatics (BiM). Member of GDR CNRS n° 3260 Antibodies and Therapeutic targeting (ACCITH) (2009-2016). National Research Platform in Bioinformatics with the Research Inter-Organization label RIO (CEA, CNRS, INRA, INSERM), from the creation of RIO in 2001 and until the creation of the GIS IBiSA in 2007. Member of GIS Infrastructures in Health Biology and Agronomy (IBiSA), coordination of the platforms of Research in Living Sciences, since the creation of the GIS in 2007. Member of National Network of platforms in Bioinformatics (ReNaBi) (2007-2014). Bioinformatics platform of the Cancéropôle Grand Sud-Ouest (GSO). Université de Montpellier since the creation of IMGT® in 1989 (Plan Pluri-formation 1999-2009). 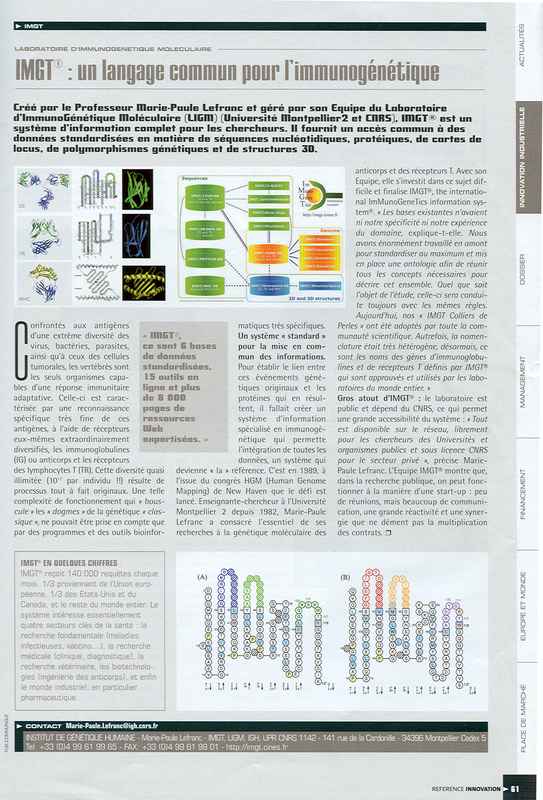 Bioinformatics platform of the Montpellier Languedoc-Roussillon Genopole®. Member of the GIS, Genopole Montpellier Languedoc-Roussillon (until 2007, creation of the GIS IBiSA). HON Certification (since July 1999). Quality management systems: ISO 9001:2008 (since October 2010), NFX 50-900, IQuaRe. The Laboratoire d'ImmunoGénétique Moléculaire (LIGM) (Prof. Marie-Paule Lefranc and Prof. Gérard Lefranc), Université Montpellier 2, UPR CNRS 1142, IGH, has been involved for more than 30 years in the genetics, structure, polymorphism and function of the immunoglobulins (IG) and T cell receptors (TR). In 1989, LIGM started IMGT/LIGM-DB, the first specialised and integrated database on immunoglobulins (IG) and T cell receptors (TR). Since May 2000 and owing to the considerable expansion and success of IMGT®, the international ImMunoGeneTics information system®, the LIGM scientific activity has been mainly devoted to the IMGT® research and development. IMGT®, founded in Montpellier in 1989 by Marie-Paule Lefranc (Université Montpellier 2 and CNRS) is the international reference in immunogenetics and immunoinformatics. IMGT® is specialized in the sequences, genes and structures of immunoglobulins (IG) or antibodies, T cell receptors (TR), major histocompatibility (MH) proteins of vertebrates, IgSF and MhSF superfamily proteins of vertebrates and invertebrates, fusion proteins for immunological applications (FPIA) and composite proteins for clinical applications (CPCA). therapeutic approaches (grafts, immunotherapy, vaccinology). IMGT® is labeled Bioinformatics Platform RIO (2001), IBiSA (since 2007), Grand Plateau Technique for Research and Innovation Languedoc-Roussillon (since 2005), Cancéropôle Grand Sud-Ouest, ReNaBi, GDR CNRS: BiM, ACCITH, Labex MabImprove, Academic Institutional Member of the International Medical Informatics Association (IMIA) (since 2006). IMGT® is certified ISO 9001:2008. IMGT® has been available on the Web since July 1995. IMGT® provides the biologists, researchers and clinicians with an easy to use and friendly interface. IMGT® has an exceptional response with more than 150,000 work sessions a month. Visitors are equally distributed between the European Union, the United States and the remaining world. IMGT/LIGM-DB data are also distributed by the HTTP or FTP and from many Sequence Retrieval System (SRS) sites. IMGT/LIGM-DB can be searched by BLAST or FASTA on different servers (EBI, Institut Pasteur, IGH...). By its high quality and its easy data distribution, IMGT® has important implications in medical research (repertoires in autoimmune and infectious diseases, AIDS, leukemias, lymphomas, myelomas, allergy), veterinary research, functional genomics, genome diversity, genome evolution studies and comparative genomics of the adaptative immune system, biotechnology related to antibody engineering (combinatorial libraries, phage displays, single chain Fragment scFv, chimeric, humanized and human antibodies), diagnostic (detection and follow up of residual diseases), and therapeutical approaches (grafts, immunotherapy, vaccinology). IMGT® has become the international reference in immunogenetics and immunoinformatics. At the cutting edge of immunology and bioinformatics, IMGT® is an invaluable integrated database for both fundamental, pharmaceutical, veterinary and clinical research. IMGT®, the international ImMunoGeneTics information system® (http://www.imgt.org) is the global reference in immunogenetics and immunoinformatics, created in 1989 by Marie-Paule Lefranc (Université de Montpellier and CNRS). IMGT® is a high-quality integrated knowledge resource specialized in the immunoglobulins (IG) or antibodies, T cell receptors (TR), major histocompatibility (MH) of human and other vertebrate species, and in the immunoglobulin superfamily (IgSF), MH superfamily (MhSF) and related proteins of the immune system (RPI) of vertebrates and invertebrates. IMGT® provides a common access to sequence, genome and structure immunogenetics data, based on the concepts of IMGT-ONTOLOGY and on the IMGT Scientific chart rules. IMGT® works in close collaboration with EBI (Europe), DDBJ (Japan) and NCBI (USA). More specifically, IMGT® uses the same accession numbers for nucleotide sequences as ENA, GenBank and DDBJ. IMGT genes are officially approved by HUGO Nomenclature Committee (HGNC) since 1999 and used by Ensembl and Vega (Hinxton, UK), NCBI Gene (all have direct links to IMGT/GENE-DB which is the international reference database for IG and TR genes). IMGT® consists of 7 databases (IMGT/LIGM-DB, IMGT/GENE-DB, etc) and 17 online interactive tools for the analysis of sequences (IMGT/V-QUEST and its high throughput version IMGT/HighV-QUEST for next generation sequencing (NGS), IMGT/DomainGapAlign, etc. ), and the analysis of genes and of three-dimensional (3D) structures. IMGT® also provides one standalone and more than 20,000 pages of Web resources. A schematic representation of the data exchanges is provided in the figure given below. IMGT® resource is unique: there is no equivalent in the USA or elsewhere in the world. Sofia KOSSIDA is IMGT® Director since 01/01/2015, Professor Université de Montpellier. Marie-Paule LEFRANC is IMGT® Founder, IMGT® Director for 25 years (since IMGT® creation in 1989 up to 2014), and currently IMGT® Executive Director Emeritus, Professor Emeritus Université de Montpellier. Mature Stage: IMGT® is a mature ELIXIR Service. It is active and new data are currently integrated and reliable. The IMGT®, the international ImMunoGeneTics information system® (http://www.imgt.org) IMGT® consists of 7 databases (cylinders) and 17 tools (rectangles). IMGT® also provides (not shown) IMGT/StatClonotype, a novel standalone tool which performs the statistical comparison of two sets of results from IMGT/HighV-QUEST for next generation sequencing (NGS) (500,000 sequences per batch) and more 20,000 pages de Web resources. Data provided by IMGT® come from academic sources and are publicly available. Six IMGT databases are publicly available to academic users: IMGT/LIGM-DB (the IMGT® nucleotide database (178,296 sequences from 351 species in October 2016), IMGT/PRIMER-DB (the IMGT®primer database), IMGT/GENE-DB (the IMGT® gene database (3,926 genes and 5,627 alleles from 24 species, of which 712 genes and 1,474 alleles for Homo sapiens and 868 genes and 1,317 alleles for Mus musculus in October 2016), IMGT/2Dstructure-DB (for antibodies and other proteins for which the 3D structure is not available) and IMGT/3Dstructure-DB (for 3D structures, contact analysis and paratope/epitope interactions of IG/antigen and TR/peptide-MH complexes), IMGT/mAb-DB (interface for therapeutic antibodies and fusion proteins for immune applications (FPIA). IMGT/CLL-DB, requires a password as it is a working place for a consortium of clinicians and contains sequences from patients prior to submission to generalist databases (ENA, GenBank, DDBJ) and publications. IMGT/StatClonotype, the IMGT® tool distributed as a standalone, is incorporated in the R package 'IMGTStatClonotype' under the LGPL licence. "The GNU Lesser General Public License (LGPL) is corporate-friendly and quite often used in R librairies. It allows for usage of certain library but modifications to it should be made public." IMGT® online services are freely accessible to academic users. IMGT interactive tools accessible from the IMGT® Home page comprise: IMGT/V-QUEST (analysis of rearranged nucleotide sequence) and its high-throughput version IMGT/HighV-QUEST (500,000 nucleotide sequences per batch), IMGT/JunctionAnalysis, IMGT/Allele-Align, IMGT/PhyloGene, IMGT/DomainDisplay (amino acid sequences), IMGT/LocusView, IMGT/GeneView, IMGT/GeneSearch, IMGT/CloneSearch, IMGT/GeneInfo, IMGT/GeneFrequency, IMGT/DomainGapAlign (for amino acid sequence analysis of IG and TR variable and constant domains, and of MH groove domains), IMGT/Collier-de-Perles (for domain graphical 2D representation), IMGT/DomainSuperimpose, IMGT/StructuralQuery (for 3D structures). A password is required from the IMGT/HighV-QUEST users as this portal requires important computational resources for which IMGT® needs to apply twice a year (GENCI). All the IMGT® reference directories are publicly available online. IMGT® uses the indicators of its Quality Management System. IMGT® has been approved by Lloyd's Register Quality Assurance France SAS to the Quality Management System Standards: ISO 9001:2008 since October, 18, 2010 and NFX 50-900 since October 13, 2014. "Research, development and provision of an integrated system (databases, tools and Web resources in immunogenetics and immunoinformatics". These indicators are analyzed regularly, by the Pilots of the SMQ processes and every year in January at the Steering Committee. Since the NFX certification, IMGT® has established Key Performance Indicators (KPI). These KPI will be reevaluated at the next Steering Committee in January 2017 to take into account the perspective of the NFX 50-900: 2016 and ISO 9001: 2015. Scientific focus and quality of science are measured by the number of publications, participations to meetings, invitations, new external collaborations and new contracts. Community served by the resource is measured by the annual survey (fundamental research, clinicians, biotechnology, big pharma, etc), e-mail exchanges, number of academic collaborations, educational workshops (IG-CLL), networks (EuroClonality), participation to education abroad on antibody informatics (USTH Hanoi, Vietnam), permanent education (Biocampus). Quality of service is measured by the SMQ indicators (e.g., response time to user messages, survey). IMGT® is in charge, since its creation in 1989 (HGM10, New Haven), of providing the international immunoglobulin (IG) and T cell receptor (TR) gene nomenclature for vertebrate species from fishes to humans. By its creation in 1989, IMGT® marked the advent of immunoinformatics, which emerged at the interface between immunogenetics and bioinformatics. For the first time, immunoglobulin (IG) or antibody and T cell receptor (TR) variable (V), diversity (D), joining (J), and constant (C) genes were officially recognized as "genes" as well as the conventional genes. This major breakthrough allowed genes and data of the complex and highly diversified adaptive immune responses to be managed in genomic databases and tools. The IMGT® Homo sapiens IG and TR gene names were approved by the Human Genome Organisation (HUGO) Nomenclature Committee (HGNC) in 1999 and were endorsed by the WHO-IUIS Nomenclature Subcommittee for IG and TR. The IMGT® IG and TR gene names are the official international reference and, as such, have been entered in IMGT/GENE-DB, in the Genome Database (GDB), in LocusLink at the National Center for Biotechnology Information (NCBI) USA, in Entrez Gene (NCBI) when this database (now designated as "Gene") superseded LocusLink, in NCBI MapViewer, in Ensembl at the European Bioinformatics Institute (EBI), and in the Vertebrate Genome Annotation (Vega) Browser at the Wellcome Trust Sanger Institute (UK). 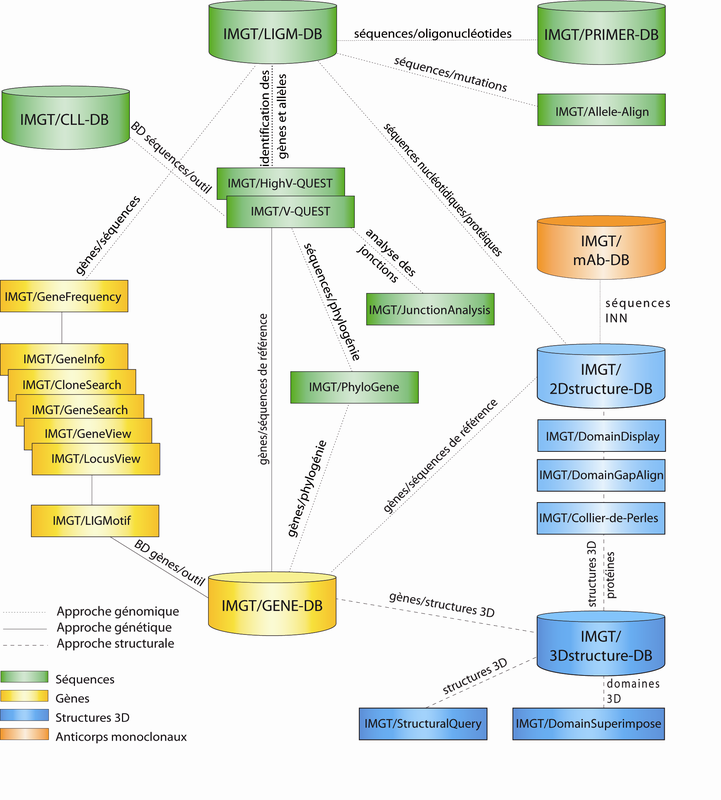 HGNC, Gene NCBI, Ensembl, and Vega have direct links to IMGT/GENE-DB. IMGT® human IG and TR genes were also integrated in IMGT-ONTOLOGY on the NCBO BioPortal and, on the same site, in the HUGO ontology and in the National Cancer Institute (NCI) Metathesaurus. Since 2007, IMGT® gene and allele names have been used for the description of the therapeutic mAb and FPIA of the WHO INN Programme. Amino acid sequences of human IG and TR constant genes (e.g., Homo sapiens IGHM, IGHG1, IGHG2) were provided to UniProt in 2008. The current collaboration has for aim the entry of the Homo sapiens germline IG variable genes in UniProt. As an ELIXIR resource, IMGT® will actively pursue the current collaborations with the different genome databases of species newly sequenced and the laboratories engaged in the characterization of the IG and TR genes (UK, Italy, USA, etc.). Indeed the same IMGT concepts IDENTIFICATION (standardized keywords), DESCRIPTION (labels), CLASSIFICATION (gene and allele nomenclature), NUMEROTATION (IMGT unique numbering) and IMGT Scientific chart rules are used whatever the species from fishes to humans. IMGT® high-quality and integrated system provides the resource for the standardized analysis of the expressed IG and TR repertoire of the adaptive immune responses in humans and other vertebrate species (e.g., animal models). They are used in basic, veterinary, and medical research, and are at the forefront of major methodological advances and medical implications. Examples of clinical applications (mutation analysis in leukemia and lymphoma, NGS repertoire analysis of the adaptive immune responses) and of pharmaceutical research and biotechnology (therapeutic antibody engineering and humanization) are given below. IMGT/V-QUEST is frequently used by clinicians for the analysis of IG somatic hypermutations in leukemia, lymphoma, and myeloma, and more particularly in chronic lymphocytic leukemia (CLL) in which a low percentage of mutations of the rearranged IGHV gene in the VH of the leukemic clone has a poor prognostic value for the patients. For this evaluation, IMGT/V-QUEST is the standard recommended by the European Research Initiative on CLL (ERIC) for comparative analysis between laboratories. The sequences of the V-(D)-J junctions determined by IMGT/JunctionAnalysis are also used in the characterization of stereotypic patterns in CLL and for the synthesis of probes specific of the junction for the detection and follow-up of minimal residual diseases (MRD) in leukemias and lymphomas. A new era is opening up in hemato-oncology with the use of NGS for analysis of the clonality and MRD identification, making IMGT® standards usage more needed as ever. IMGT/HighV-QUEST is the first web portal for next generation sequencing (NGS) immunoprofiling (online since October 2010). It is a paradigm for identification of IMGT clonotype diversity and standardized comparison of the NGS IG and TR repertoire analysis (diversity and expression) of the adaptive immune responses in normal (vaccination) and pathological situations (infectious diseases, cancers). 255 terabytes of results generated. The therapeutic monoclonal antibody engineering field represents the most promising potential in medicine. IMGT® standards usage is needed more than ever before in antibody humanization and engineering, IG and TR engineering for immunotherapy, search of new specificities and targets, paratope/epitope characterization as demonstrated by the IMGT/DomainGapAlign tool and the IMGT/2Dstructure-DB, IMGT/3Dstructure-DB and IMGT/mAb-DB databases. Indeed, a standardized analysis of IG genomic and expressed sequences, structures, and interactions is crucial for a better molecular understanding and comparison of the mAb specificity, affinity, half-life, Fc effector properties, and potential immunogenicity. IMGT-ONTOLOGY concepts have become a necessity for IG loci description of newly sequenced genomes, antibody structure/function characterization, antibody engineering [single chain Fragment variable (scFv), phage displays, combinatorial libraries] and antibody humanization (chimeric, humanized, and human antibodies). IMGT® standardization allows repertoire analysis and antibody humanization studies to move to novel high-throughput methodologies with the same high-quality criteria. The CDR-IMGT lengths are now required for mAb INN applications and are included in the WHO INN definitions, bringing a new level of standardized information in the comparative analysis of therapeutic antibodies. 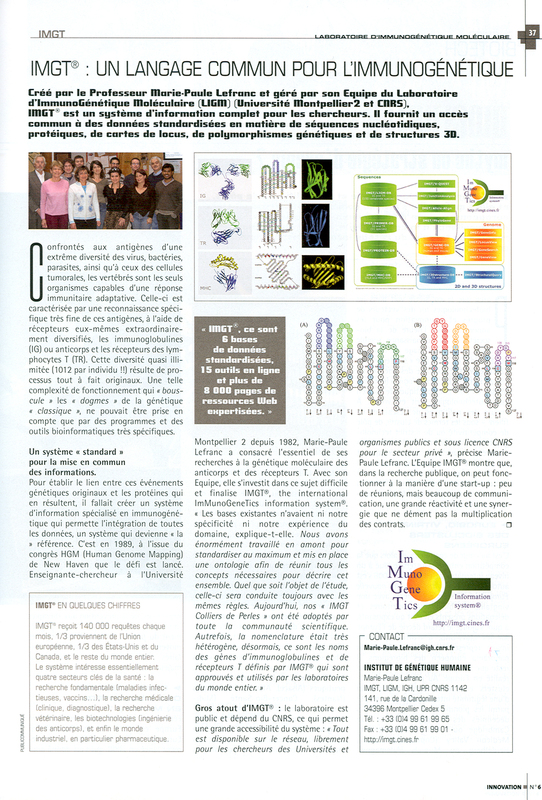 (1) IMGT® is a team of the Institut de Génétique Humaine (UPR CNRS 1142). The permanent positions depend on the French Ministère de la Recherche et de l'Enseignement Supérieur. The present and former IMGT® directors are Professors of the Université de Montpellier. There are 7 permanent positions: 4 from the University (1 PU, 2 Emeritus PU, 1 research engineer IR) and 3 from CNRS (1 research engineer IR, 2 engineers IE). (2) The salaries of the 8-10 CDD IE CNRS (biocurators, bioinformaticians) (turn-over of 3 years) are financed on pharmaceutical industry agreements with CNRS. (3) Biocampus contributes to the renewal of PC and/or servers. (4) IMGT/HighV-QUEST is granted access to the HPC@LR and to the High Performance Computing (HPC) resources of the Centre Informatique National de l'Enseignement Supérieur (CINES) and to Très Grand Centre de Calcul (TGCC) of the Commissariat l'Energie Atomique et aux Energies Alternatives (CEA) under the allocation  (2010-2016) made by GENCI (Grand Equipement National de Calcul Intensif). Previous funding sources include several EU grants (BIOMED, BIOTECH, 5th PCRDT, 7th PCRDT), IBiSA, ANR and Region Languedoc-Roussillon funding (listed on the web site). IMGT® has an international Scientific Committee since 1994. IMGT® is regularly evaluated scientifically by the SAB of the IGH. IMGT® databases, tools and Web resources are constantly updated. New version numbers and dates are indicated on the web site and the users have the possibility to subscribe to the IMGT news RSS to be informed. Lefranc M-P. Antibody Informatics: IMGT, the International ImMunoGeneTics Information System, In: Crowe J, Boraschi D, Rappuoli R (Eds). Antibodies for Infectious Diseases. ASM Press, Washington, DC. doi: 10.1128/microbiolspec. AID-0001-2012, 2015, pp. 363-379. Lefranc M-P. IMGT® immunoglobulin repertoire analysis and antibody humanization. In: Alt, F.W, Honjo, T, Radbruch A. and Reth, M. (Eds. ), Molecular Biology of B cells, Second edition, Academic Press, Elsevier Ltd, London, UK, Chapter 26, 2014, pp. 481-514. dx.doi.org, ISBN : 978-0-12-397933-9. Lefranc M-P. How to use IMGT® for therapeutic antibody engineering. In: Dübel S. and Reichert J. (Eds), Handbook of Therapeutic Antibodies (4 vol. ), Second edition, Wiley, Volume 1: Defining the right antibody composition, Chapter 10, 2014, pp. 229-264. Lefranc M-P. Antibody informatics: IMGT®, the international ImMunoGeneTics information system®, the international ImMunoGeneTics information system®. Microbiol Spectrum 2014, 2(2):AID-0001-2012. doi:10.1128/microbiolspec.AID-0001-2012. s IMGT/LIGM-DB The IMGT® database for nucleotide sequences with translation of immunoglobulins (IG) and T cell receptors (TR). IMGT/PRIMER-DB The IMGT® database for oligonucleotides (primers) of immunoglobulins (IG) and T cell receptors (TR). IMGT/GENE-DB The IMGT® database for immunoglobulin (IG) and T cell receptor (TR) genes and alleles (international nomenclature). IMGT/3Dstructure-DB The IMGT® database for 3D structures of immunoglobulins (IG) or antibodies, T cell receptors (TR), major histocompatibility (MH) proteins, related proteins of the immune system (RPI) and fusion proteins for immune applications (FPIA). IMGT/2Dstructure-DB The IMGT® database for 2D structures (IMGT Colliers de Perles) of immunoglobulins (IG) or antibodies, T cell receptors (TR), major histocompatibility (MH) proteins and related proteins of the immune system (RPI). IMGT/mAb-DB The IMGT® database for monoclonal antibodies (mAb) or immunoglobulins (IG), fusion proteins for immune applications (FPIA) and composite proteins for clinical applications (CPCA). s IMGT/V-QUEST IMGT® tool for nucleotide sequence alignment and analysis of immunoglobulin (IG) or antibody and T cell receptor (TR) variable domains, integrates IMGT/JunctionAnalysis, IMGT/Automat and IMGT/Collier-de-Perles. IMGT/HighV-QUEST IMGT® portal for NGS high-throughput nucleotide sequence analysis of immunoglobulins (IG) and T cell receptors (TR) variable domains, integrates IMGT/JunctionAnalysis and IMGT/Automat. IMGT/JunctionAnalysis IMGT® tool for the analysis of the nucleotide sequences of the V-J and V-D-J junctions of the variable domains of the immunoglobulins (IG) or antibodies and T cell receptors (TR). IMGT/PhyloGene IMGT® tool to compute and draw phylogenetic trees for immunoglobulin (IG) and T cell receptor (TR) V-REGION nucleotide sequences. IMGT/DomainDisplay The IMGT® tool for the display of the amino acid sequences of the variable (V), constant (C) and groove (G) domains. IMGT/LocusView IMGT® tool providing a view of immunoglobulin (IG), T cell receptor (TR) and major histocompatibility (MH) loci. IMGT/GeneFrequency IMGT® tool providing the frequency usage of immunoglobulin (IG) and T cell receptor (TR) variable (V), diversity (D) and joining (J) genes in Homo sapiens and Mus musculus rearranged sequences from IMGT/LIGM-DB. IMGT/StructuralQuery IMGT® tool to retrieve IMGT/3Dstructure-DB entries using amino acid structural criteria for variable (V), constant (C) or groove (G) domains. Membre Académique Institutionnel de l'International Medical Informatics Association (IMIA). RIO depuis sa création en 2001, GIS IBiSA depuis sa création en 2007, ReNaBi depuis sa création. Labex MabImprove [ANR-10-LABX-53-01], GDR CNRS n° 3003 Molecular Bioinformatics (BiM), GDR CNRS n° 3260 Antibodies and Therapeutic targeting (ACCITH). Grand Plateau Technique pour la Recherche et l'Innovation Languedoc-Roussillon (GPTR), depuis la création des GPTR en 2005. IMGT® est une marque enregistrée CNRS (registered trademark) (Union Européenne, Canada, Etats-Unis). 1 cluster SGI ALTIX ICE (jade) 267 Tflop/s 23040 cœurs, calcul (CINES) 2011. 10.000h (IBM) et 500.000h (BULL) ont été attribuées à IMGT® (projet x2015036029) sur le Centre de Calcul du CINES, ainsi que 300.000h (BULL) sur le Très Grand Centre de calcul (TGCC) du Commissariat à l'Energie Atomique et aux Energies Alternatives (CEA). En première session DARI 2016, 250.000h (BULL, CINES) et 200.000 h (BULL, TGCC CEA) ont été attribuées à IMGT®. IMGT a également accès au HPC@LR. 1. IMGT/LIGM-DB est la base de données internationale pour les séquences nucléotidiques d'IG et TR de l'homme et des autres espèces de vertébrés avec traduction des séquences entièrement annotées. 3. IMGT/GENE-DB. Des liens réciproques existent entre IMGT/GENE-DB et la base de données 'Gene' au NCBI (ceci est le seul exemple de liens directs effectués par Gene au NCBI sur une base de données externe). 6. IMGT/CLL-DB, la base de données IMGT® des séquences IG de patients atteints de leucémie lymphoïde chronique, créée en 2007. 7. IMGT/mAb-DB, la base de données IMGT® des anticorps monoclonaux et des protéines de fusion à visée thérapeutique, créée en 2009. 1. IMGT Scientific chart fournit le vocabulaire contrôlé et les règles d'annotation basés sur IMGT-ONTOLOGY. 2. IMGT Repertoire fournit une interface conviviale aux données soigneusement expertisées qui concernent le génome, le protéome, le polymorphisme et la structure des IG et TR de l'homme et des autres vertébrés. 3. IMGT Index, IMGT Education, IMGT Aide-mémoire, IMGT Bloc-notes. 5. IMGT Medical page fournit aux cliniciens les informations d'IMGT® sur les bases, outils et données d'intérêt médical. 6. IMGT Veterinary page fournit aux vétérinaires les informations d'IMGT® sur les génomes, séquences et structures 3D des IG et TR des espèces animales. 7. IMGT Biotechnology page fournit un ensemble d'informations sur l'ingénierie des anticorps (phage display), les anticorps de camélidés, l'humanisation des anticorps monoclonaux thérapeutiques. IMGT® comprend dix-sept outils interactifs en ligne pour l'analyse des séquences (5), des gènes (7), des domaines protéiques (3) et des données structurales (2). 3. IMGT/HighV-QUEST, pour les séquences IG et TR issues du Next Generation Sequencing (NGS). 4. IMGT/Allele-Align permet la comparaison de deux allèles. 5. IMGT/PhyloGene calcule et représente les arbres phylogénétiques des séquences nucléotidiques d'IG et de TR. 1. IMGT/DomainDisplay affiche les domaines protéiques selon la numérotation unique IMGT. 2. IMGT/DomainGapAlign permet de créer les « gaps » selon la numérotation unique IMGT. 3. IMGT/Collier-de-Perles fournit la représentation standardisée « IMGT Colliers de Perles » des domaines. 1. IMGT/StructuralQuery permet de faire des requêtes basées sur une description structurale. 2. IMGT/DomainSuperimpose superpose deux structures 3D de domaines. IMGT®, the international ImMunoGeneTics information system® http://www.imgt.org, est la référence internationale en immunogénétique et immunoinformatique. IMGT® est une marque déposée du CNRS (Union Européenne, Canada et Etats-Unis). IMGT® est membre institutionnel académique de l'International Medical Informatics Association (IMIA) depuis 2006. IMGT® est spécialisé dans les séquences, structures et données génétiques des immunoglobulines (IG), des récepteurs T (TR), des protéines majeures d'histocompatibilité (MH) des vertébrés, des protéines apparentées du système immunitaire (RPI, pour Related Proteins of the Immune system) des superfamilles IgSF et MhSF des vertébrés et invertébrés, des protéines de fusion pour applications immunologiques (FPIA, pour fusion proteins for immune applications)et des protéines composites pour applications cliniques (CPCA, pour composite proteins for clinical applications). IMGT® est composé de sept bases de données (séquences, gènes et structures tridimensionnelles (3D)), de dix-sept outils interactifs et de plus de 15.000 pages de ressources Web . IMGT® est reconnu internationalement pour la richesse et la qualité de ses données scientifiques et son interface conviviale. Le nombre d'équipes utilisatrices d'IMGT® est supérieur à 80.000. Ces équipes académiques et industrielles appartiennent à des domaines d'activité de recherche professionnelle variés et sont réparties dans le monde entier, à parts égales entre les Etats-Unis et Canada, l'Europe et le reste du monde. Ceci représente plus de 200.000 requêtes par mois et un nombre de sessions de travail sans cesse croissant (300.000 en 2015). (7) recherche pour le diagnostic, le pronostic et le suivi thérapeutique des leucémies, lymphomes et myélomes (identification du ou des clone(s) malin(s) et évaluation de la maladie résiduelle), (8) approches thérapeutiques (greffes, immunothérapie, vaccinologie). University of Science and Technology of Hanoi. 1. Knowledge of databases for sequences and structures of antibodies. 2. Using tools for sequence analysis: applications to the study of repertoires of antibody recognition sites and to the study of specificities (autoimmune diseases, infectious diseases, AIDS, leukemias, lymphomas, myelomas...). 3. Bioinformatic structural analysis for the humanization of monoclonal antibodies for therapeutic purposes (IMGT Collier de Perles methodology). 4. Structural analysis of antibody fragments and their recognition sites for the discovery of new drugs. This teaching unit is based in particular on the tools and databases developed by IMGT®, the international ImMunoGeneTics information system ®, http://www.imgt.org, the international reference system used by many pharmaceutical companies (JANSSEN Centocor Research and Development Inc. Johnson & Johnson USA, AMGEN Inc. USA, Sanofi-Aventis GmbH Germany, Merck & Co. Inc. USA, Chugai Pharmaceutical Co. Ltd. Japan, Astellas Pharma Inc. Japan, Agensys Inc. USA, Merck Serono SA Switzerland, F. HOFFMAN-LA ROCHE Switzerland, etc..). The teaching requires a PC connected to Internet per student. Accès en ligne des 7 bases de données, 17 outils et aux 15.000 pages de ressources Web. L'accès à IMGT® est libre, gratuit pour les académiques, sous licences et contrats avec le CNRS pour les industriels. 2. Distribution des données d'IMGT/LIGM-DB sur les serveurs IMGT (http://www.imgt.org/download/LIGM-DB) et par FTP sur les serveurs de l'EBI (ftp://ftp.ebi.ac.uk/pub/databases/imgt/LIGM-DB). 3. Distribution des données d'IMGT/GENE-DB sur les serveurs IMGT (http://www.imgt.org/download/GENE-DB/). 4. Distribution des données d'IMGT/3Dstructure-DB sur les serveurs IMGT(http://www.imgt.org/download/3Dstructure-DB/). 6. Accès aux données par DAS et Dbfetch à l'EBI et LinkOut au NCBI. 7. Comparaison de séquences par rapport aux séquences de références d'IMGT/GENE-DB, d'IMGT/DomainDisplay, d'IMGT/3Dstructure-DB et des séquences de domaines par BLAST sur le serveur IMGT (IMGT/BlastSearch Query page). 8. Comparaison de séquences par BLAST et FASTA, par rapport à celles de IMGT/LIGM-DB, sur les serveurs de l'EBI et de l'Institut Pasteur. 9. Références croisées avec HGNC, NCBI Gene, Vega, UniProt, Sequence Ontology. 10. Aides spécifiques et conseils aux utilisateurs et API. Aouinti S, Malouche D, Giudicelli V, Kossida S, Lefranc M-P.
PLoS ONE. 2015 Nov 5;10(11):e0142353. doi: 10.1371/journal.pone.0142353. eCollection 2015. Free Article PMID: 26540440 Correction: PLoS ONE 2016 Jan 5;11(1): e0146702. doi: 10.1371/journal.pone.0146702 View correction. PMID: 26731095. Piccinni B, Massari S, Caputi Jambrenghi A, Giannico F, Lefranc M-P, Ciccarese S, Antonacci R.
Giudicelli V, Duroux P, Lavoie A, Aouinti S, Lefranc M-P, Kossida S.
Antibodies for Infectious Diseases. ASM Press, Washington, DC. doi: 10.1128/microbiolspec. AID-0001-2012, 2015, pp. 363-379. Li L, Wang XH, Williams C, Volsky B, Steczko O, Seaman MS, Luthra K, Nyambi P, Nadas A, Giudicelli V, Lefranc M-P, Zolla-Pazner S, Gorny MK. Baliakas P, Agathangelidis A, Hadzidimitriou A, Sutton LA, Minga E, Tsanousa A, Scarfò L, Davis Z, Yan XJ, Shanafelt T, Plevova K, Sandberg Y, Vojdeman FJ, Boudjogra M, Tzenou T, Chatzouli M, Chu CC, Veronese S, Gardiner A, Mansouri L, Smedby KE, Pedersen LB, Moreno D, Van Lom K, Giudicelli V, Francova HS, Nguyen-Khac F, Panagiotidis P, Juliusson G, Angelis L, Anagnostopoulos A, Lefranc M-P, Facco M, Trentin L, Catherwood M, Montillo M, Geisler CH, Langerak AW, Pospisilova S, Chiorazzi N, Oscier D, Jelinek DF, Darzentas N, Belessi C, Davi F, Ghia P, Rosenquist R, Stamatopoulos K.
Xochelli A, Agathangelidis A, Kavakiotis I, Minga E, Sutton LA, Baliakas P, Chouvarda I, Giudicelli V, Vlahavas I, Maglaveras N, Bonello L, Trentin L, Tedeschi A, Panagiotidis P, Geisler C, Langerak AW, Pospisilova S, Jelinek DF, Oscier D, Chiorazzi N, Darzentas N, Davi F, Ghia P, Rosenquist R, Hadzidimitriou A, Belessi C, Lefranc M-P, Stamatopoulos K.
Lefranc M-P, Giudicelli V, Duroux P, Jabado-Michaloud J, Folch G, Aouinti S, Carillon E, Duvergey H, Houles A, Paysan-Lafosse T, Hadi-Saljoqi S, Sasorith S, Lefranc G, Kossida S.
In: Dübel S, Reichert J (Eds), Handbook of Therapeutic Antibodies (4 vol. ), Second edition, Wiley, Volume 1: Defining the right antibody composition, Chapter 10, 2014, pp. 229-264. Shirai H, Prades C, Vita R, Marcatili P, Popovic B, Xu J, Overington JP, Hirayama K, Soga S, Tsunoyama K, Clark D, Lefranc M-P, Ikeda K.
Gogoladze G, Grigolava M, Vishnepolsky B, Chubinidze M, Duroux P, Lefranc M-P, Pirtskhalava M.
Ciccarese S, Vaccarelli G, Lefranc M-P, Tasco G, Consiglio A, Casadio R, Linguiti G, Antonacci R.
Alamyar A, Giudicelli V, Duroux P, Lefranc M-P.
Ouled-Haddou H, Ghamlouch H, Regnier A, Trudel S, Herent D, Lefranc M-P, Marolleau J, Gubler B. Six A, Mariotti-Ferrandiz ME, Chaara W, Magadan S, Pham H-P, Lefranc M-P, Mora T, Thomas-Vaslin V, Walczak AM, Boudinot P.
In: Dubitzky W, Wolkenhauer O, Cho K-H, Yokota H (Eds), Encyclopedia of Systems Biology, New York: Springer Science+Business Media, LLC, 2013, pp. 944-952. In: Dubitzky W, Wolkenhauer O, Cho K-H, Yokota H (Eds), Encyclopedia of Systems Biology, New York: Springer Science+Business Media, LLC, 2013, pp. 952-959. In: Dubitzky W, Wolkenhauer O, Cho K-H, Yokota H (Eds), Encyclopedia of Systems Biology, New York: Springer Science+Business Media, LLC, 2013, pp. 964-972. In: Dubitzky W, Wolkenhauer O, Cho K-H, Yokota H (Eds), Encyclopedia of Systems Biology, Springer Science+Business Media, LLC, New York, 2013, pp. 959-964. Li S, Lefranc M-P, Miles JJ, Alamyar E, Giudicelli V, Duroux, P, Freeman JD, Corbin VDA, Scheerlinck J-P, Frohman MA, Cameron PU, Plebanski M, Loveland B, Burrows SR, Papenfuss AT, Gowans EJ. Consanguinity In: Stanley Maloy and Kelly Hughes, editors. Brenner's Encyclopedia of Genetics 2nd edition, Vol 2. San Diego: Academic Press; 2013. pp. 158-162. Castro R, Jouneau L, Pham HP, Bouchez O, Giudicelli V, Lefranc M-P, Quillet E, Benmansour A, Cazals F, Six A, Fillatreau S, Sunyer O, Boudinot P.
The IMGT® information system is localized at the Laboratoire d'ImmunoGénétique Moléculaire (LIGM), Institut de Génétique Humaine (IGH) of the Centre National de la Recherche Scientifique (CNRS), Montpellier, France. IMGT/HighV-QUEST HPC resources are hosted at the Centre Informatique National de l'Enseignement Supérieur (CINES). The Web servers are HTTP and Tomcat from The Apache Software Foundation. The databases are hosted on Sybase system (Sybase Inc.) and MySQL™. The programs are written in Java, Perl and Bourne shell. The Internet access is provided by the french academic network RENATER. The project of an integrated system in Immunogenetics has been started in 1989 by Marie-Paule Lefranc, Professor Université Montpellier 2, CNRS, Montpellier, France. A prototype of the ImMunoGeneTics information system was developed in France for Immunoglobulin and T cell receptor sequences (LIGM-DB) by the Laboratoire d'ImmunoGénétique Moléculaire (LIGM, CNRS, Université Montpellier 2, Montpellier), in collaboration with the Centre National Universitaire Sud de Calcul (CNUSC, Montpellier, Sophie Creuzet and Denys Chaume) and the Laboratoire d'Informatique, de Robotique et de Micro-électronique de Montpellier (LIRMM, CNRS, Université Montpellier 2, Montpellier, Isabelle Mougenot and Patrice Déhais). In 1992 the database became truly european with the collaboration of EMBL (Rainer Fuchs), IFG (Werner Müller), ICRF (Julia Bodmer) and the obtention of a EU European Union BIOMED1 funding (BIOCT930038). IMGT/LIGM-DB is available on the Web server of CINES at Montpellier since July 1995. The first demonstration on-line was performed at the 9th International Congress of Immunology at San Francisco, USA (23-29 July 1995). IMGT/MHC-HLA, for human MH1 and MH2 (or HLA) sequences maintained by ANRI, London, is on the EBI server since December 1998. 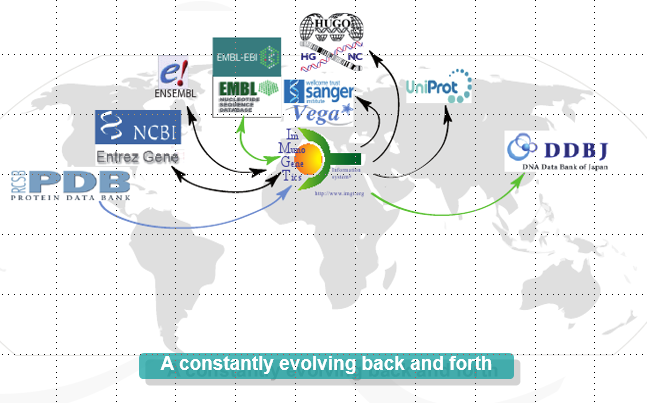 IMGT®, the international ImMunoGeneTics information system®, enhanced its development through the European Community 5th PCRDT funding QLG2-2000-01287 (collaboration between LIGM, EMBL-EBI, Cancer Research UK, EUROGENTEC and BPRC), and then ImmunoGrid of the EU 6th PCRDT (IST-2004-028069). Since 2008, IMGT® is part of ELIXIR. Guide Européen de l'innovation (in French). In: INNOVATION, l'Economie de la croissance, Septembre-Octobre 2007, n° 10, p. 80. In: INNOVATION, l'Economie de la croissance, n° 6, Janvier-Février 2007, p. 37. In: Guide Européen de l'Innovation, site Internet du magazine Référence Innovation. In: Reference INNOVATION, n° 5, November-December 2006, pp. 60-61. In: Reference Business, Industries Sante/Agro, septembre/octobre 2006, n°11, p. 63. In: Reference Business, Les industries de la santé, janvier/février 2006, n°8, p. 94. Tissue Antigens, Vol 65, 6 issues (January 2005 to July 2005). 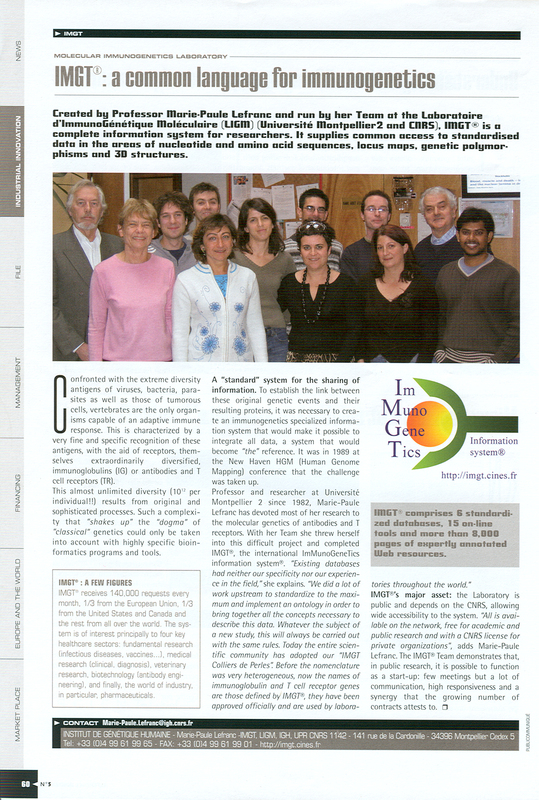 A WebWatch report on IMGT, by Kevin Ahern, BioTechniques Euro Edition, The Journal of Laboratory Technology for Bioresearch n° 66, p. 17 (July/August 2004). Life Sciences Prize for "Innovation-Research-Enterprise" by the Association for Education and Research Development (ADER). Editorial by Warr G.W., Clem W. and Söderhall K. in Developmental Comparative Immunology (DCI) for the launch of the IMGT Locus in Focus section in DCI, in January 2003. Dev Comp. Immunol. 27,1 (2003) PMID: 12477495. We thank Elsevier Science for allowing IMGT to make available, on the IMGT site, the PDF file of the Editorial. In: Nucleic Acids Research - The Molecular Biology Database Collection: 2003 update. NetWatch of Science "Blueprints of Immunity"
A NetWatch report on IMGT, by Mitch Leslie, Science, vol. 296, n°5571, p.1207 (17 May 2002). 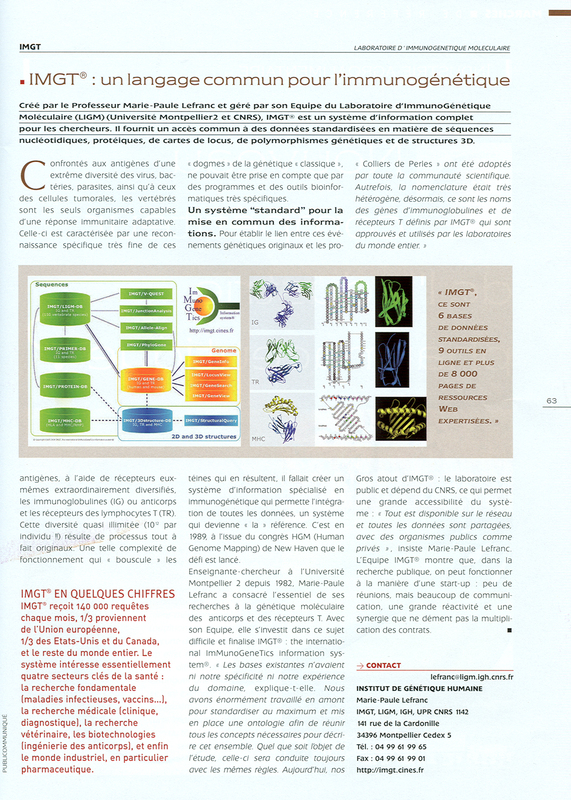 La Gazette du Laboratoire n°64, p. 21 (2002). In: Biotechnology programme (1994-98) Project reports (Vol. 2), p. 84. Quality of Life and management of living resources, European Commission EUR19405 (2001) ISBN: 92-894-0240-7. Genome Biology web report on IMGT "A high-quality database of molecules of the immune system"
A Genome Biology report by Christopher I. Thorpe. Report date: 1st September 1999 - Published: 17 March 2000. Nucl. Acids Res., vol. 27 n°1 (January 1999) Database issue. 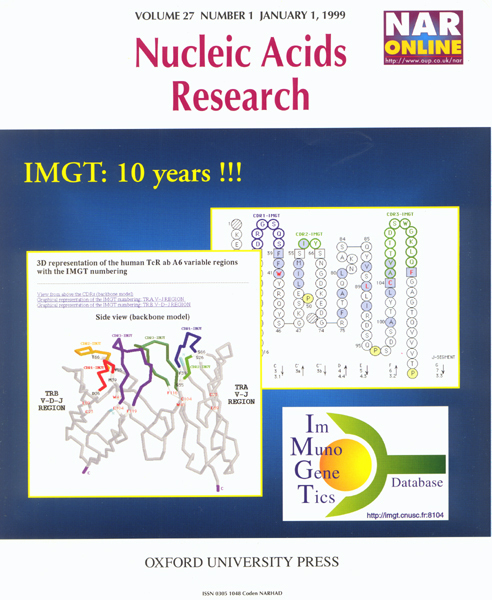 The cover features an example of IMGT/Colliers de Perles and 3D representation for T cell receptor V-REGIONs, available at IMGT, The international ImMunoGeneTics information system®, http://www.imgt.org, created in 1989 by Marie-Paule Lefranc, Montpellier, and described in the article on pp. 209-212 of this issue. Lefranc, M.-P. et al., Nucleic Acids Research, 27, 209-212 (1999) PMID: 9847182 LIGM:209.